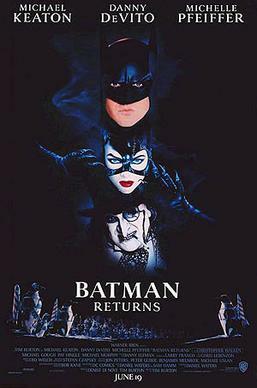 BATMAN RETURNS (1992) is the second of the four “Burton/Schumacher” summer blockbuster Batman films of the late 1980s and 1990s from Warner Bros. Pictures. It was preceded by BATMAN in 1989 and followed by BATMAN FOREVER in 1995. It starred Michael Keaton as Batman/Bruce Wayne, Danny DeVito as The Penguin, Michelle Pfeiffer as Catwoman, Michael Gough as Alfred, Pat Hingle as Commissioner Gordon, and Christopher Walken as Max Shreck. It was directed by Tim Burton from a screenplay by Daniel Waters with the story by Sam Hamm and Waters; produced by Denise Di Novi and Burton; and was released on June 16, 1992. BATMAN RETURNS grossed $266.8 million worldwide and was the #3 movie at the box office in 1992. The plot consists of the deformed, sewer-dwelling Oswald Cobblepott – AKA “The Penguin” – teaming up with corrupt Gotham businessman Max Shreck to run for mayor and take over Gotham. The Penguin also forms a partnership with Shreck’s former assistant Selina Kyle – now known as “Catwoman” – to take out The Batman. Meanwhile, Selina Kyle and Bruce Wayne begin a romantic relationship. After Batman exposes The Penguin and Shreck as criminals, ruining Cobblepotts run as mayor, The Penguin attempts to kidnap and kill the children of Gotham’s wealthiest citizens. Batman ends up thwarting The Penguin’s plan and saving Gotham yet again. While BATMAN RETURNS is considered a box office and critical success, the reaction to it by the general audience and fans is mixed at best. Its dark, dour, and macabre tone turned many people off, resulting in a lower than expected box office. Warner Bros. responded by mandating that the next film in the series be “lighter.” The result was Burton being replaced by director Joel Schumacher and Val Kilmer replacing Keaton as Batman.